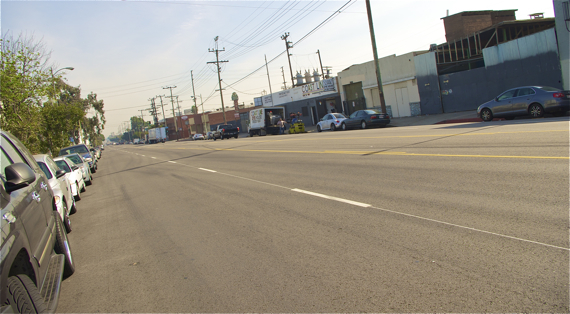 Take a ride along Olympic Blvd. 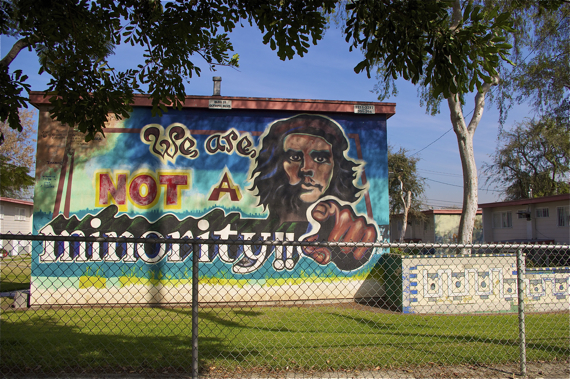 in Boyle Heights, and you will be struck by how unwelcoming it can feel to humans. The street is quite wide and busy at certain times of the day, often supporting heavy truck traffic. The industrial sites that populate the area are generally windowless and sometimes rather noisy. At night, the road is quite dark and the area can feel empty, save for a few food trucks and vendors that draw small crowds. 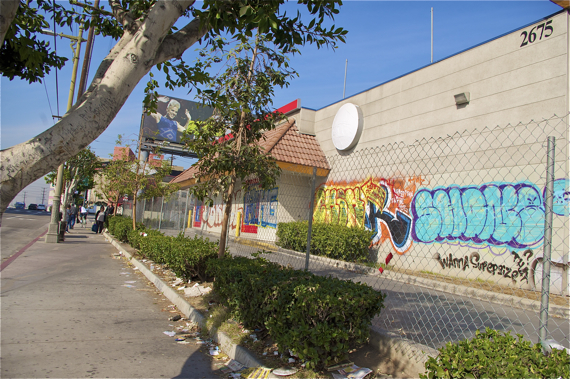 The sidewalks are often strewn with garbage (especially adjacent to vacated sites). And, along certain sections of the boulevard, you get a nice view overlooking Vernon and all the smokestacks sending pollution your way. It doesn’t mean there aren’t people there — indeed, there are a lot. And there’s art, too. It comes in the form of a cluster of more than 50 historically significant murals depicting Chicano themes, history, and traditions in the housing development of Estrada Courts (for more see here and here). But, it’s not enough to make the street feel human-scale. Which is why it was so exciting to see a photo exhibit go up on the chain-link fence at Costello Park on Jan. 17th. 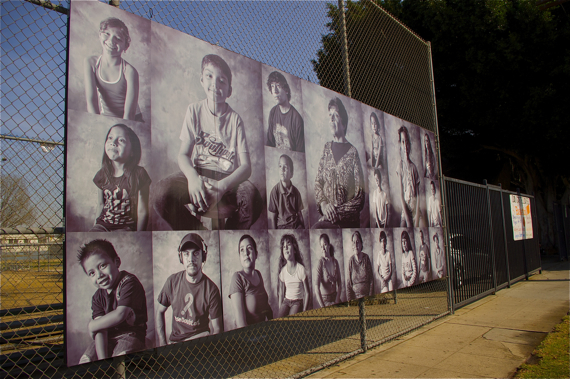 The temporary installation, a photo mural comprised of images of community members, is the second such installation in the Reflejos y Regalos de East Los (Reflections and Gifts of East Los) site-specific art project. In celebration of their 40th anniversary, Boyle Heights’ socially conscious and community-oriented arts center Self Help Graphics & Art teamed up with photographer Rafael Cardenas (with support from the Pasadena Art Alliance and the NEA) to create a participatory project that would both engage the community and reflect the community back to itself. Inspired by a cache of old black and white photos found buried in a box, says Evonne Gallardo, Executive Director at SHG, they set up pop-up photo booths in Mariachi Plaza, Costello Park, and Hollenbeck Park and invited people gathered there to sit for portraits. “We’re so used to billboards conveying messages that come from outside the community,” says Gallardo. Or, art projects that are either vague and/or inaccessible or rely on an antiquated aesthetic that may not be as relevant to people today. Photographs of current inhabitants would not only provide a snapshot of the community as it is, but also showcase residents as comprising a beautiful mosaic, one that might help inspire them to reimagine their community. Cardenas, a long-time resident whose work often features Boyle Heights and its inhabitants, shot the photos. Sometimes it took some convincing, he says. At Costello Park, for example, they set up photo booth during the Summer Night Lights program and did not give people advance notice. So, while the kids were often excited about being photographed, their parents or grandparents tended to be more reluctant, saying they weren’t properly dressed for the occasion. Upon seeing herself as the larger-than-life centerpiece at the unveiling of the mural last weekend, however, a grandmother (after lamenting that she was wearing the same blouse she had on in the photo), felt moved to give an impromptu speech. She had recently lost four people in her life, she said. And, although she admitted she had only sat for the photo to please her grandson, she was proud to see it there. A number of the subjects were not on hand for the unveiling, Cardenas tells me. Costello Park sits between two housing developments and people in the area have little in the way of disposable income. Phone numbers or contact information recorded over the summer were unfortunately not valid by the new year. Which is why the placement of the mural — even temporarily — in a gathering space that is well-used by the community is so important. The kids will see themselves as they go back and forth to school or to play at the rec center, and be able to take pride in serving as the literal faces of their community for the thousands that pass through it every day. But, it isn’t just about sticking art somewhere that people will see it, says Gallardo. It’s about building bridges and strengthening ties between disparate members of the community separated both by socio-economics and geography (Boyle Heights is sliced up by the 5, the 10, the 60, and the 101 fwys). The exhibit will be up at Costello Park (3141 E Olympic Blvd.) for another few weeks. The final installation goes into Hollenbeck Park on February 21st (event info is here). If you’d like to check out the amazing murals at Estrada Courts, they are located one block east of Costello Park. Gentri-flyer Opens One Hell of a Conversation. Now What? If Cleanliness is Next to Godliness, Surely it Should Also be a Component of “Complete”-ness, No? I See London, I See France. I See L.A.’s Dirty Underpass(es).